According to Robert A. Cloward, “In the doctrinal and devotional writings of this dispensation, no chapter of Isaiah is more often cited” than Isaiah 29.1 The precedent was set by the Lord himself in 1820, when he paraphrased Isaiah 29:13 while telling Joseph Smith that none of the churches available at the time were true (see Joseph Smith—History 1:19). Many centuries earlier, however, the prophet Nephi linked Isaiah 29 to this dispensation by using several phrases and sometimes long blocks of text from Isaiah 29 and likening them to Joseph Smith and the restoration. Isaiah 29 permeates Nephi’s writings, especially 2 Nephi 25–30.2 What is curious about Nephi’s use of Isaiah 29 is that he never outright quotes this chapter, like he does with Isaiah 48–49 (1 Nephi 21–22) and Isaiah 2–14 (2 Nephi 12–24). Instead, he makes frequent use of Isaiah 29 as part of his “own prophecy” wherein he spoke “somewhat concerning” the words of Isaiah he had just copied from the plates of brass (2 Nephi 25:7, 1). Nephi had seen the Restoration and coming forth the Book of Mormon in vision (1 Nephi 13:32–42). When Nephi read about “a book that is sealed,” taken by men to “one that is learned, saying, Read this, I pray thee,” and then subsequently taken to “him that is not learned” (Isaiah 29:11–12), he found apt words to adopt in describing certain events which would unfold in the life of Joseph Smith (2 Nephi 27:15–19). 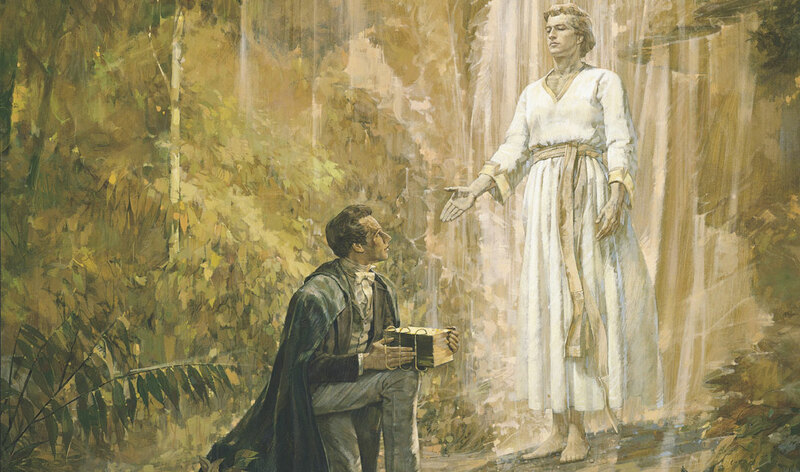 Isaiah’s description of “speech … whisper[ing] out of the dust” with a “familiar spirit” naturally reminded Nephi that the book he saw would come up out of the ground, carrying a spirit that resonates in the hearts of truth seekers everywhere (Isaiah 29:4; cf. 2 Nephi 26:16). Its powerful message would penetrate the hearts of those who were spiritually “deaf” and “blind” and lead their souls “out of obscurity, and out of darkness” (Isaiah 29:18; cf. 2 Nephi 27:29). In Isaiah, Cloward explained, the sealed book is symbolic. “No specific book is mentioned” by Isaiah, whose “concern was the lost vision of his people, not books. … Isaiah’s symbolic sealed book is still sealed today.”4 But Nephi’s sealed book is real, and it has come forth in the latter-days. Second, instead of assuming that Nephi is giving a more accurate version of Isaiah 29, the expansions and rewordings can be understood as Nephi’s adaptations to what he saw in vision. Nephi recognized Isaiah’s words as suitable for describing his vision, but not necessarily perfect. So, as he adapted Isaiah’s words, he made expansions and emendations as he saw fit to reflect more accurately the future events he witnessed. This also means there is no need to expect more ancient manuscripts of the Isaiah text to confirm any of Nephi’s changes. Finally, this provides yet another glimpse into the process of “likening.”11 This time, however, Nephi’s likening is different. Instead of direct quoting, followed by application, Nephi is actively applying Isaiah’s words while quoting them by adapting them to his prophetic vision. Furthermore, with the Joseph Smith Translation of Isaiah 29, there is yet another layer of likening, this time from a modern-day prophet. Brant A. Gardner, Second Witness: Analytical and Contextual Commentary on the Book of Mormon, 6 vols. (Salt Lake City, UT: Greg Kofford Books, 2007–2008), 2:360–365, 377–397. Robert A. Cloward, “Isaiah 29 and the Book of Mormon,” in Isaiah in the Book of Mormon, ed. Donald W. Parry and John W. Welch (Provo, UT: FARMS, 1998), 191–247. 1. Robert A. Cloward, “Isaiah 29 and the Book of Mormon,” in Isaiah in the Book of Mormon, ed. Donald W. Parry and John W. Welch (Provo, UT: FARMS, 1998), 191. 2. Language from Isaiah 29 can also be found in 1 Nephi 14:7; 22:8 (Isaiah 29:14), 2 Nephi 6:15 (Isaiah 29:6), and several places in 2 Nephi 26–28. See John W. Welch and Gregory J. Welch, Charting the Book of Mormon: Visual Aids for Personal Study and Teaching (Provo, UT: FARMS, 1999), 97. See Cloward, “Isaiah 29 and the Book of Mormon,” 204–217 for identification and analysis of all the different allusions to Isaiah 29 in 2 Nephi 25–30. 3. Cloward, “Isaiah 29 and the Book of Mormon,” 202. For examples of other scholars taking this view, see the works mentioned in John S. Thompson and Eric Smith, “Isaiah and the Latter-day Saints: A Bibliographic Survey,” in Isaiah in the Book of Mormon, 455, 472, 479, and 490. The earliest example is from 1955. Also see Brant A. Gardner, Second Witness: Analytical and Contextual Commentary on the Book of Mormon, 6 vols. (Salt Lake City, UT: Greg Kofford Books, 2007–2008), 2:360–365 (commenting on 2 Nephi 26:15–16), and 376–397 (commenting on 2 Nephi 27). 4. Cloward, “Isaiah 29 and the Book of Mormon,” 200. 5. Cloward, “Isaiah 29 and the Book of Mormon,” 201. 6. Gardner, Second Witness, 2:377. For more background on pesher, see David J. Larsen, “Exegete as Prophet? The Case of the Interpretation of the Psalms at Qumran,” presentation given at the Dead Sea Scrolls Conference, hosted by The Leonardo, Salt Lake City, April 11–12, 2014; published proceedings forthcoming. 9. For the history of this visit, see Michael Hubbard McKay and Gerrit J. Dirkmaat, From Darkness unto Light: Joseph Smith’s Translation and Publication of the Book of Mormon (Salt Lake City and Provo, UT: Deseret Book and Religious Studies Center, Brigham Young University, 2015), 39–59; Richard E. Bennett, “Martin Harris’s 1828 Visit to Luther Bradish, Charles Anthon, and Samuel Mitchill,” in The Coming Forth of the Book of Mormon: A Marvelous Work and a Wonder, ed. Dennis L. Largey, Andrew H. Hedges, John Hilton III, and Kerry Hull (Salt Lake City and Provo, UT: Deseret Book and Religious Studies Center, Brigham Young University, 2015), 103–115. 10. See discussion in Cloward, “Isaiah 29 and the Book of Mormon,” 223–226. 12. Cloward, “Isaiah 29 and the Book of Mormon,” 232. Cloward further reasoned, “If he had understood the Book of Mormon to preserve a more complete and correct text of Isaiah 29 from the brass plates, he would likely have substituted for chapter 29 all of the Book of Mormon version,” which he did not do. In fact, “He retained all the references to Jerusalem in the first seven verses. If he had understood Isaiah to prophesy that the Nephites and Lamanites would be brought down and would ‘speak out of the ground’ and ‘whisper out of the dust,’ we would likely have copied 2 Nephi 26:15–16 in the JST” (p. 232). 13. Cloward, “Isaiah 29 and the Book of Mormon,” 233. 14. As Cloward puts it, “Isaiah foresaw both the fate and the future restoration of Jerusalem and her people. Nephi … likened Isaiah’s words to his people in a new prophecy, showing how Nephite writings would advance the Lord’s work in the latter days. … Joseph Smith, in turn, replaced Isaiah’s words in his inspired translation of the Bible with his new understanding of how they had been likened to him and to the Lord’s latter-day work.” Cloward, “Isaiah 29 and the Book of Mormon,” 233. 15. Cloward, “Isaiah 29 and the Book of Mormon,” 233–234.